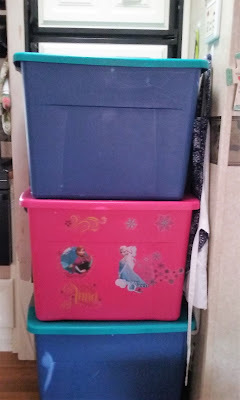 In addition to their two shelves in the closet, each of our kids has one tub for their personal things. I don't police what they choose to keep with them. These sit on their beds. It seemed essential when we were first ditching suburbia. They are stored on their bunks. Moving them each evening and morning seemed like a small price to pay. BUT they are HEAVY.....when they aren't on the bunks, they block plastic shelving units we are using on the unused 4th bunk. When we travel, Stacia and I pull them to the middle or front of the Caboose. Today, I picked the first one up with EASE and then each of the others.